Summer continues, with not a whole lot of change in the forecast through the weekend. As has been the case for much of the week, a moderately strong ridge of high pressure will continue to assert some control over our weather to bring August-like conditions to the area. 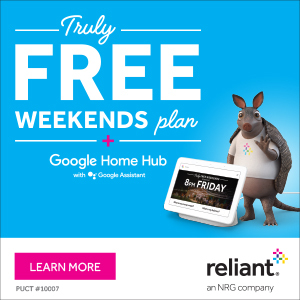 You know the drill by now—partly to mostly sunny days, high temperatures in the mid- to upper-90s with humidity, and lows in the upper 70s. A few (very few, most likely) areas will see some showers during the late morning and afternoon hours, but for the most part we should be dry. This is classic August weather for Houston. By late Sunday or Monday, an upper-level low pressure system will begin to influence our weather as well, which should bring some changes. 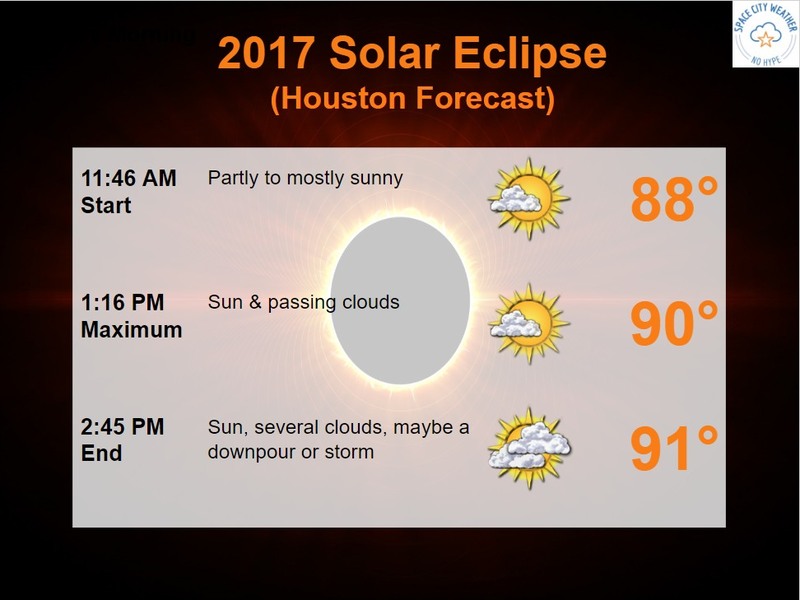 Most notably, we’ll see a few more clouds (we discuss eclipse concerns below), some better rain chances, and lower high temperatures, perhaps in the low 90s. By no means are we looking at widespread, heavy rainfall, but 30 to 40 percent of the region should see a couple of tenths of an inch of rainfall on both days. Highs should jump back up into the mid-90s by the second half of next week. Unfortunately for the eclipse, the low pressure system on Monday will likely increase cloud coverage during the daytime. However, at this point I still expect partly to mostly sunny skies during the morning, and this will hopefully extend into the early afternoon—for Houston, maximum coverage of the Sun by the Moon comes at 1:16 pm. We shall see. Meanwhile, in the tropics, Tropical Storm Harvey seems likely to form soon as it approaches the Lesser Antilles. Typically we’d be very concerned about such a system, but for now it appears most likely to remain on a due westward course across the Caribbean Sea, meaning that probably will not move into the central Gulf of Mexico. Here’s a look at the model tracks for the system, now known as Invest 91L. 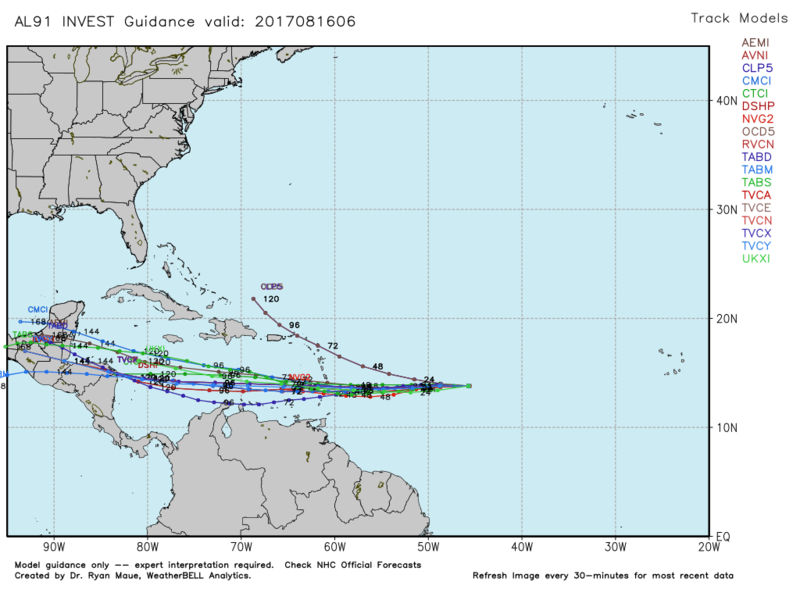 What do you think of Invest 92, some models have it in the Gulf, possible IKE track? Not Eric, but I’ll tackle this! 92 has a lot of possibilities. As of right now there are no models showing an Ike storm. Most models take it on this track toward Florida, don’t develop it much at all, and eventually turn it north and east away or just sort of dissipate it in place. That being said, anytime you have showers and thunderstorms moving into the Bahamas or Gulf this time of year, you stay alert. So while there’s no reason to be concerned at all right now, it would make sense to continue babysitting it. Didn’t the NHC say 92L might briefly become a tropical depression or storm before conditions became less favorable in their tropical weather outlook, Matt? 92L has a lot of shear around it, so while it could briefly become a TD, I think it’s going to struggle pretty significantly over the next 3-4 days. I’m more concerned about 92L becoming another Rita-type storm and heading for SE Texas/SW LA. Think that’s going to happen, Matt? It’s far too early to speculate on anything regarding any of the systems. We just need to watch them and not over-worry about them right now. Long way to go. Newsflash, Matt! Current models now take 92L into Cuba. That could be a prelude to a Louisiana or Texas landfall next week. Stay tuned! This page includes has many links to other information and resources, including how to safely view the eclipse, how to determine if your filter is still safe, and finding reputable vendors of filters. What does the drought situation look like for Texas and Houston today and compared to a year ago? You’d be accurate in your assessment there! This is a tricky question. I’m not sure offhand which one statistically does better. But it’s important to understand that these “spaghetti” plots, while useful, have some limitations. Some of these models are better utilized for storm intensity rather than track. Others, the opposite. It gets messy. There’s a good primer on weather.com (I know, I know) explaining some of the details behind some of the acronym soup you see for each model. https://weather.com/science/weather-explainers/news/spaghetti-models-tropics-tropical-storm-hurricane Hope this helps a bit. We struggle with this with every storm. Even the gold standard, the Euro, has had its share of notable failures in recent years too. Sometimes I like to think of these models as a bunch of C-list actors without an A-lister on the bill. Thanks Matt…I particularly appreciate the last part about “C-list actors without an A-lister”…that tells me NOT to get too enamored with any of these…that’s an excellent recommendation!